The Atlas, with three-row seating and built in VW's plant in Chattanooga, is a key part of the company's U.S. strategy. Volkswagen Group's plans to expand production at its only U.S. factory risk being disrupted by uncertainty over possible trade barriers under President Donald Trump, who has been particularly critical of Germany. The maker of the Passat sedan is considering assembling additional SUVs at its plant in Chattanooga, Tennessee, with the goal of lifting the site to full production capacity by 2020. The German manufacturer may build electric cars there as well. Those plans depend on clear signals from the U.S. administration, according to Herbert Diess, head of VW’s namesake car brand. While VW makes the Passat sedan and Atlas SUV in Chattanooga, it’s vulnerable to any new import tariffs as most of the vehicles it sells in the U.S. come from Mexico and Europe. Boosting sales and reversing losses in North America is a crucial part of Diess’s effort to strengthen the VW nameplate’s weak profit margins outside China and emerge from the diesel-emissions scandal. Trump has repeatedly complained about Germany’s trade surplus with the U.S., particularly blaming the auto industry for selling too many cars in the country. The four-door Arteon coupe, which will be priced at about 34,800 euros ($39,100) when it goes on sale in Germany this month, could further expose Volkswagen to Trump’s ire. The new flagship will be produced at VW’s northern German factory in Emden and shipped to markets including China and the U.S.
German carmakers have recently been keen to underscore their U.S. credentials amid pressure from the Trump administration. Daimler AG this week said it’s on track with the $1.3 billion expansion at its Alabama factory. The Stuttgart-based automaker also said it sees “ value” in sourcing more parts in the U.S. to make its Mercedes-Benz vehicles churned out there even more American. BMW AG has invited Trump to attend an event later this month celebrating the 25-year anniversary of its factory in South Carolina, the Munich-based carmaker’s biggest production facility worldwide. BMW executive Peter Schwarzenbauer said the company is “relaxed” about Trump’s criticisms of German exports, as it is in regular communication with U.S. authorities. While VW is holding back in the U.S., its expansion in China is moving ahead. The company signed a pact Thursday with Jianghuai Auto to set up a new 50/50 joint venture to develop and produce so-called New Energy Vehicles, which includes electric cars. The partnership involves an investment of 6 billion yuan ($880 million). Volkswagen’s $1 billion Chattanooga car factory employs about 3,200 people and can produce 150,000 vehicles annually. Until recently, the site’s only product was the $22,440 midsize Passat, but the facility wasn’t fully utilized as U.S. demand for the model faded. Only 73,000 autos were delivered last year. In late 2016, the factory started making the $30,000 Atlas. 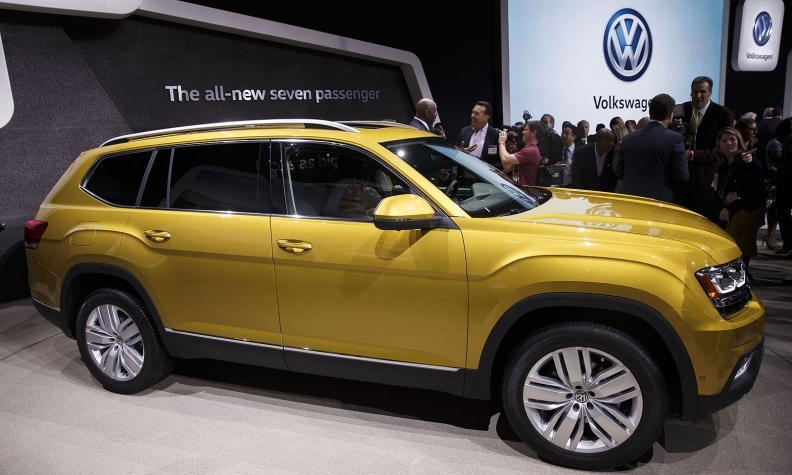 VW’s first midsize crossover and a longer-wheelbase version of the smaller Tiguan are intended to boost sales in the increasingly popular segment.